Going from a somewhat pop-punk sound to a metal sound is a pretty natural progression. How would you say your taste in music has progressed over the years? Would you say that the people you worked with had an influence on it at all? There were a lot of moments and a lot of people that have influenced me over the years, but [the] main influence that I’ll say is the relationships I have with Matt [Drake] and Ken [Corke] and the band. 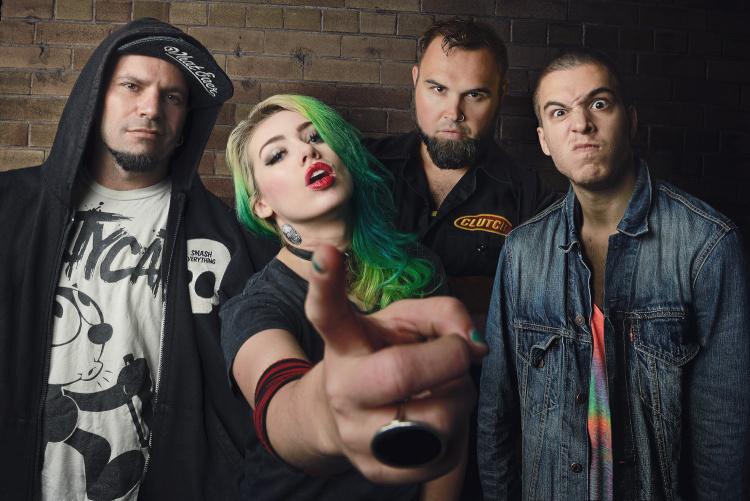 They are in Sumo Cyco, have been with me since I was 14 and we were doing pop music and they were my backing band. I pretty much grew up with them showing me bands. They were the cooler seniors at high school, I wanted to know what they thought was cool because I was younger than them and they had been through the industry. They had played in a bunch of bands and knew all of this music that I hadn’t been exposed to. They were the ones that introduced me to so much of the music that I love. Along the way I worked with some pretty cool people. At the end of my pop days when I got to write a lot in Los Angeles, I worked with Tim Armstrong and he has such a cool community around him. All of the bands and the people that I met through him were so cool. We had this great sense of community, helping each other out and always being in each other’s music videos and hanging out together. I loved that. That was very punk rock days of going to shows and playing with Rancid and things like that. I had a bit of an identity crisis when things weren’t going so well with the label and I realized that I’d been “shelved”, where they put you on the shelf and don’t work you anymore, [but] you’re still kind of tied into the contract so you’re not free to move around and do stuff. You’re just kind of sitting there. I had to really re-address my priorities. In all of my interviews and all of the headlines were “teen pop singer” and I was like “I’m not going to be a teen much longer, I’m going to be a young adult and what does that mean for me? How do I transition into that world?” Doing disney stuff and being on Nickelodeon to being taken seriously and having a long lasting career. I had to think about what I wanted to do and Sumo Cyco has been about completely freeing myself from any rules. In some ways I think it’s limited the type of opportunities that I have in the industry because I decided to do something that was so on my own terms and so crazy. On the other hand, it’s a very liberating experience, knowing that everything that we do accomplish as a band is done 100 per cent on our own terms and because we worked really hard to get to get to these places, not because we moulded our songs towards what a label wanted or what the radio stations wanted to play. Everything that we accomplish is because we really love what we do and are authentic to it. I find that pretty interesting too, because it’s not typical. All of those artists that got in like that, Hannah Montana, Lindsay Lohan, they made a quite opposite transition. I made that decision, I really wanted to stick it out and try it. It has been a totally different experience than the way things came about when I was younger, [but] both have been such great learning experiences. Going through everything I went through when I was younger was such a great learning experience, to know what I really wanted out of my future music career. It’s a different world now. The industry has changed so much, it’s crazy when I’m still in my mid 20’s and I talk about being in the industry for 15 years. It’s a long time that I’ve been doing this, learning in the industry and meeting people. I really can’t picture myself doing anything else. It’s been that kind of thing where at one point I thought, “do I want to go back to school, and do I want to try something else with my life completely apart from entertainment?” I couldn’t. What would it have been if you had gone back to school? It can be just an expensive piece of paper when you look at it. Yeah, for some people school is great for them, but I grew up being homeschooled. Being in a classroom felt like such a long time ago. I was in middle school the last time I was in a classroom, so it felt like [it wasn’t] my place to learn, I needed to learn very hands on. I decided I’m going to keep going for it, keep getting the experience, keep putting myself out there and taking risks and some of them paid off. Some of them didn’t work out so well, but they’re all learning experiences. So that’s important to me, having great experiences in your life, even if they’re “successes” or “failures”, as long as you have personal growth, it’s worth it. Some of the best music comes out of those successes or failures. It makes you learn, think and feel.